When it works, Big Data can be a beautiful thing – what organization wouldn’t want more actionable information with which to feed better data driven decisions in the quest for a competitive advantage? But in the race to acquire Big Data, leaders can easily wander off course with devastating results. According to EMC (disclosure: client), only about 1/3 of companies are able to effectively use Big Data. In today’s post I’ll examine the pitfalls awaiting those companies in pursuit of Big Data. Clearly some organizations (Amazon, Google, The Federal Government, etc.) are better positioned to exploit the opportunities afforded by Big Data than others. Here’s the thing – not every corporation has access to, much less the ability to collect, assess, and operationalize data in exabytes (about 1 Billion gigabytes). The amount of infrastructure and staff it takes to integrate data from disparate, yet ubiquitous inputs is staggering. The harsh reality is that for every one company able to harness Big Data, hundreds will fail in their attempt to do so. 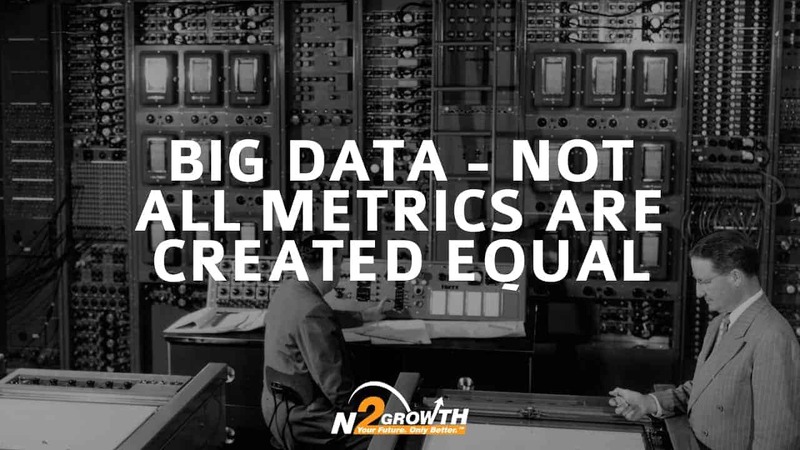 MBO’s, KPI’s, segmentation, analytics, and now Big Data. All leaders measure things – the question is are they measuring the right things, for the right reasons, and at the right times? While I don’t dispute the value of Big Data, I would rather see organizations realistically focus their efforts on operationalizing knowledge at whatever volume or velocity they can currently handle and then worry about scale. Let me be clear – metrics are at best useless, and quite possibly harmful, if the wrong things are being measured, and especially where quantity is valued over quality. In a previous column on Forbes I caution leaders about relying too heavily on “data” by explaining not all data is good data (this is worth reading). It has been my experience that most businesses at least attempt to measure items 1 and 4, but often times fail to measure the other 3 categories, which also happen to be the most meaningful measurements. The best managed companies measure all 5 categories (as well as various subsets) with their focus being on items 3 and 5. Let’s begin by stating what should be the obvious – all businesses need to monitor the basic static financial measurements of revenue, expenses, break-even, earnings and cash flow. While analyzing these drivers will give you some basic operating information, they are also somewhat myopic. The reason I say this is while historical analysis is important, it is taking the next step of using these historical measurements as baselines to calculate forward looking return drivers that will help you fine tune your business. While the following overview is not by any means exhaustive, it provides a great jumping-off point to fuel productive thought and conversation. Metrics such as Return on Assets (ROA), Return on Equity (ROE), Return on Investment (ROI), Return on Cash (cash-on-cash), and Return on Human Capital (ROHC) will give you more useful information than the static calculations mentioned above. The great thing about return analysis is that each area can be broken down into several more refined qualitative return calculations. A great example of qualitative return analysis would be contribution margin (CM), which is a qualitative measure of segment, team, or individual performance on profit. Another example would be Return on Innovation which would be the qualitative measure of the impact on new initiatives. These types of qualitative return drivers allow you to make forward looking investment decisions that can have immediate impact to the business. Measurements in this category would be items like revenue hurdles, billable time, utilization, production hurdles and service levels. These are the metrics of how an organization performs against its benchmarks. Measurements in this category are where an organization truly becomes productive with analytics. These sets of metrics focus on the measurements surrounding things that generate influence, improve culture, develop talent, create engagement, build teams, manage the consumer experience, improve customer satisfaction and increase brand equity. Getting to the qualitative level of performance measurement is difficult in that it is often necessary to overcome a set of traditional leadership behaviors and beliefs. Ask yourself this question…do you measure the metrics that are critically important, or just the ones that are obvious and easy to measure? If company leadership can make the attitudinal adjustments necessary to create accountability and focus on qualitative performance metrics, they will find it’s these measurements that help to catalyze growth, enable execution and create dynamic organizations. Thoughts? I’d also be interested in hearing from you with regard to any measurements/metrics which have been particularly beneficial to you. Do You Have An Internet Strategy? Hi Mike, I like how you assigned categories to the various metrics. Very helpful. I think one of the most important categories outside of quantitative return drivers is the qualitative performance drivers. This is what companies like Disney and Apple truly understand and where most other companies fall short, I just returned from a Disney cruise and it’s absolutely amazing how much time and effort they invest in creating the guest experience. This plays a critical role in maximizing their quantitative return. If we make our customers and our employees who interact with the customers our top priority, everything else should fall into place. Thanks for your thoughts and your leadership. Thanks for sharing your observations, and I don’t think you could have cited two better examples of companies than understand the customer experience than Disney and Apple.